Binding Agreement and General Use Rules. Please read this web page carefully. It contains the Terms and Conditions governing your access to and use of the Federal Resume Experts Web Site (“Site”) and Services. The terms "You" and "User" as used herein refer to all individuals and/or entities accessing Federal Resume Experts.com for any reason. The term “post” or “provide” as used herein shall mean information or materials that you submit on the Site or to us. By accessing this Site, you agree to be bound by these Terms and Conditions whether or not you have read them or not. If you do not accept these Terms and Conditions or you do not meet or comply with their provisions, you may not use the Site or Services. These Terms and Conditions, (as they may be amended from time to time by Federal Resume Experts without notice) form a binding agreement (the "Agreement") between you and Federal Resume Experts. Your access to use and/or continued use of the Site or Services indicates your acceptance of these and/or new, modified or amended Terms and Conditions. You are agreeing to use the Site at your own risk. The Site is intended for individuals seeking federal and/or private sector (civilian) employment. You may use this Site only for lawful purposes within the stated context of Federal Resume Experts’ intended and acceptable use of the Site. Federal Resume Experts is the sole interpreter of the Site’s intended and acceptable use. Federal Resume Experts means its editors, officers, directors, shareholders, employees, affiliates, or agents. Federal Resume Experts Web Site" or the "Site: includes www.federalresumeexperts.com in its entirety and includes its Content, Text, Graphics, Design, Programming and Services as applicable in the context. Document: refers to any information provided, posted, produced, transmitted, emailed, faxed, mailed, sent, or communicated by an Editor or User on the Site or to or from us or to or from you. Services: means any resume, KSA includes SES ECQs/MTQs (or equivalent) or any other services, documents, materials or information provided on the Site by Federal Resume Experts, its editors or agents. Sales: means credit card transactions and/or any other payment method made by a User to Federal Resume Experts. Job Seeker: means a User who is accessing the Site to search for a job or in any other capacity. "You" and "you”: means the customer, cardholder or person who (or the entity on behalf of whom you are acting) that is agreeing to these Terms and Conditions. Certified Editor or Writer: means a current federal employee with extensive experience making revisions, formatting and/or other modifications and/or improvements to a resume. Intellectual Property Rights. The Site and all rights, title and interest in and to the Site is the sole property of Federal Resume Experts or its licensors, and is protected by U.S. copyright and international treaties. Federal Resume Experts reserves for itself and its licensors all rights, title and interest. Without limitation on the foregoing, you may not reproduce, modify, display, sell, or distribute the Content, or use it in any other way for public or commercial purpose. This includes copying or adapting the HTML code used to generate Web pages on the Site. "Federal Resume Experts," the Federal Resume Experts’ design logo and certain other names or logos are service marks or trademarks of Federal Resume Experts, and all related product and service names, design marks and slogans are the service marks or trademarks of Federal Resume Experts. In addition, the "look" and "feel" of the Site (including color combinations, button shapes, layout, design and all other graphical elements) are also protected by Federal Resume Experts’ trademarks, service marks and copyrights. All other product and service marks contained on the Site are the trademarks of their respective owners. Disclaimers and Limitations on Federal Resume Experts’ Liability. Federal Resume Experts assumes no responsibility for Documents produced by its Editors and no responsibility for the activities, omissions or other conduct of its Editors. Federal Resume Experts is not an employment agency or a recruiting firm, and makes no representations or guarantees regarding the effectiveness or timeliness of the Site in meeting the employment objectives of Users. Effectiveness of services and/or results may vary; Federal Resume Experts does not guarantee that Documents provided by us or Editors will result in Users being interviewed or hired, and is not responsible for any employment decisions, for whatever reason made by any User, outside individual or entity. Federal Resume Experts is not a government agency and therefore does not make or influence hiring decisions. Nothing on the Site shall be considered an endorsement, representation or warranty with respect to any User or third party, whether in regards to its web site, products, services, hiring, experience, employment or recruiting practices, or otherwise. WARRANTY DISCLAIMERS. (a) THE SITE IS PROVIDED ON AN 'AS IS' BASIS WITHOUT ANY WARRANTIES OF ANY KIND, EXPRESS OR IMPLIED. Federal Resume Experts, TO THE FULLEST EXTENT PERMITTED BY LAW, DISCLAIMS ALL WARRANTIES, INCLUDING, BUT NOT LIMITED TO, THE WARRANTIES OF MERCHANTABILITY, TITLE, NON-INFRINGEMENT OF THIRD PARTIES’ RIGHTS, AND FITNESS FOR PARTICULAR PURPOSE. Federal Resume Experts MAKES NO WARRANTIES ABOUT THE ACCURACY, EFFECTIVENESS, RELIABILITY, COMPLETENESS, OR TIMELINESS OF THE SITE. (i) Federal Resume Experts DOES NOT WARRANT THAT THE SITE WILL OPERATE ERROR-FREE OR THAT THE SITE AND ITS SERVERS ARE FREE OF COMPUTER VIRUSES OR OTHER HARMFUL MECHANISMS. IF YOUR USE OF THE SITE RESULTS DIRECTLY OR INDIRECTLY IN THE NEED FOR SERVICING OR REPLACING EQUIPMENT OR DATA, Federal Resume Experts IS NOT RESPONSIBLE FOR THOSE COSTS. YOU EXPRESSLY UNDERSTAND AND AGREE THAT FEDERAL RESUME EXPERTS AND ITS SUBSIDIARIES, AFFILIATES, OFFICERS, EMPLOYEES, EDITORS, AGENTS, PARTNERS AND LICENSORS SHALL NOT BE LIABLE TO YOU FOR ANY DIRECT, INDIRECT, INCIDENTAL, SPECIAL, CONSEQUENTIAL OR EXEMPLARY DAMAGES, INCLUDING, BUT NOT LIMITED TO, DAMAGES FOR LOSS OF PROFITS, LOSS OF EMPLOYMENT OR EMPLOYMENT OPPORTUNITIES, GOODWILL, USE, DATA OR OTHER INTANGIBLE LOSSES (EVEN IF FEDERAL RESUME EXPERTS HAS BEEN ADVISED OF THE POSSIBILITY OF SUCH DAMAGES), RESULTING FROM: (i) THE USE OR THE INABILITY TO USE THE SITE OR SERVICE; (ii) THE COST OF PROCUREMENT OF SUBSTITUTE GOODS AND SERVICES RESULTING FROM ANY GOODS, DATA, INFORMATION OR SERVICES PURCHASED OR OBTAINED OR MESSAGES RECEIVED OR TRANSACTIONS ENTERED INTO THROUGH OR FROM THE SITE OR SERVICE; (iii) UNAUTHORIZED ACCESS TO OR ALTERATION OF YOUR TRANSMISSIONS OR DATA; (iv) STATEMENTS OR CONDUCT OF ANY THIRD PARTY ON THE SITE; OR (v) ANY OTHER MATTER RELATING TO THE SITE OR SERVICES. (ii) Federal Resume Experts makes no representations or guarantees regarding the truthfulness, accuracy, effectiveness, completeness, timeliness or reliability of any services or Documents posted by Editors, or of any other form of communication engaged in by Editors. Documents may contain inaccuracies, spelling or typographical errors which you may or may not be required to correct yourself in accordance with the “same day resume revision rule”. You agree that any reliance on Documents provided by Editors, or on any other form of communication with Editors, will be at your own risk. The 100% Satisfaction guarantee is subject to the same day federal resume revision rule and is not a money back guarantee. (iii) Federal Resume Experts makes no representations or guarantees regarding the Content of the Site, including, but not limited to, broken links, inaccuracies or typographical errors. Employment results may vary. Federal Resume Experts cannot guarantee and does not promise any specific results whatsoever from use of Federal Resume Experts.com or this Site in any way, including, but not limited to, federal government employment or advancement, private sector employment or advancement, or interviews. No documents, materials or information, whether electronic, oral or written, obtained by a User from Federal Resume Experts, its editors or from its officers, directors, shareholders, employees, affiliates, agents or advertisers shall create any warranty not expressly stated herein. DAMAGE LIMITATIONS, ALLOCATIONS OF LIABILITY AND EQUITABLE RELIEF. (a) YOU ASSUME AND EXPRESSLY UNDERSTAND AND AGREE THAT ALL RESPONSIBILITY AND RISK FOR YOUR USE OF THE SITE, THE INTERNET GENERALLY, AND THE DOCUMENTS YOU ARE PROVIDED BY FEDERAL RESUME EXPERTS ITS EDITORS AND FOR YOUR CONDUCT ON AND OFF THE SITE. FEDERAL RESUME EXPERTS AND ITS SUBSIDIARIES, AFFILIATES, OFFICERS, EMPLOYEES, EDITORS, AGENTS, PARTNERS AND LICENSORS EXPRESSLY DISCLAIM ALL WARRANTIES OF ANY KIND, WHETHER EXPRESS OR IMPLIED, INCLUDING, BUT NOT LIMITED TO THE IMPLIED WARRANTIES OF MERCHANTABILITY, FITNESS FOR A PARTICULAR PURPOSE AND NON-INFRINGEMENT. (b) IN NO EVENT SHALL FEDERAL RESUME EXPERTS (OR ANY OF ITS OFFICERS, DIRECTORS, SHAREHOLDERS, EMPLOYEES, EDITORS, AFFILIATES, AGENTS OR ADVERTISERS), BE LIABLE FOR ANY NON-DIRECT DAMAGES WHATSOEVER (INCLUDING, WITHOUT LIMITATION, INCIDENTAL AND CONSEQUENTIAL DAMAGES, LOST PROFITS, OR DAMAGES RESULTING FROM LOST DATA, LOST EMPLOYMENT OR OPPORTUNITY, OR BUSINESS INTERRUPTION) RESULTING FROM OR ARISING UNDER OR IN CONNECTION WITH THE USE OR ACCESS TO, OR THE INABILITY TO USE OR ACCESS, THE SITE AND/OR ANY DOCUMENT, WHETHER BASED ON WARRANTY, CONTRACT, TORT, OR ANY OTHER LEGAL THEORY, AND WHETHER OR NOT FEDERAL RESUME EXPERTS IS ADVISED OF THE POSSIBILITY OF SUCH DAMAGES. FEDERAL RESUME EXPERTS’ MAXIMUM LIABILITY ARISING OUT OF OR IN CONNECTION WITH THIS SITE OR YOUR USE OF THE FEDERAL RESUME EXPERTS CONTENT, REGARDLESS OF THE CAUSE OF ACTION (WHETHER IN CONTRACT, TORT, BREACH OF WARRANTY OR OTHERWISE), WILL NOT EXCEED $10. (c) IN NO EVENT SHALL FEDERAL RESUME EXPERTS (OR ANY OF ITS OFFICERS, DIRECTORS, SHAREHOLDERS, EMPLOYEES, EDITORS, AFFILIATES, AGENTS OR ADVERTISERS), BE LIABLE FOR ANY DAMAGES OF ANY KIND ARISING FROM THE USE OF THIS SITE, INCLUDING, BUT NOT LIMITED TO, DIRECT, INDIRECT, INCIDENTAL, CONSEQUENTIAL AND PUNITIVE DAMAGES. ANY MATERIAL DOWNLOADED OR OTHERWISE OBTAINED THROUGH THE USE OF THE SITE IS ACCESSED AT YOUR OWN DISCRETION AND RISK, AND YOU WILL BE SOLELY RESPONSIBLE FOR ANY DAMAGE TO YOUR COMPUTER SYSTEM OR LOSS OF DATA THAT RESULTS FROM THE DOWNLOAD OF ANY SUCH MATERIAL. A SMALL PERCENTAGE OF USERS MAY EXPERIENCE EPILEPTIC SEIZURES WHEN EXPOSED TO CERTAIN LIGHT PATTERNS OR BACKGROUNDS ON A COMPUTER SCREEN OR WHILE USING THE SERVICE. CERTAIN CONDITIONS MAY INDUCE PREVIOUSLY UNDETECTED EPILEPTIC SYMPTOMS EVEN IN USERS WHO HAVE NO HISTORY OF PRIOR SEIZURES OR EPILEPSY. IF YOU, OR ANYONE IN YOUR FAMILY, HAVE AN EPILEPTIC CONDITION, CONSULT YOUR PHYSICIAN PRIOR TO USING THE SERVICE. IMMEDIATELY DISCONTINUE USE OF THE SERVICE AND CONSULT YOUR PHYSICIAN IF YOU EXPERIENCE ANY OF THE FOLLOWING SYMPTOMS WHILE USING THE SERVICE: DIZZINESS, ALTERED VISION, EYE OR MUSCLE TWITCHES, LOSS OF AWARENESS, DISORIENTATION, ANY INVOLUNTARY MOVEMENT, OR CONVULSIONS. (d) Due to the nature of this Agreement, in addition to money damages, you agree that Federal Resume Experts will be entitled to equitable relief upon a breach of this agreement by you. (e) “CREDIT CARD DISPUTE WAIVER” PROVISION: Since Federal Resume Experts begins working immediately upon receipt of your order and the product is customized as agreed to herein, we do not offer refunds on services provided. You assume and expressly understand and agree that all sales on this Site are final and waive your right to dispute payment to Federal Resume Experts with your credit card provider. Federal Resume Experts enforces a strict no refund policy on all sales once services have been provided to the User regardless of User satisfaction. You assume and expressly understand and agree that any claim made by you to your credit card company after services have been provided to you that assert that you as the authorized account holder of said credit card company received merchandise or services from Federal Resume Experts that were not as described or were received in “defective” condition will be NULL AND VOID regardless of any MasterCard or Visa regulations to the contrary, including but not limited to, regulations which pertain to non-face-to-face transactions (mail orders, telephone orders, Internet orders, etc. ); you assume and expressly understand and agree to waive your right to dispute payment to Federal Resume Experts via your payment method (credit card company) once services have been provided to you regardless of any MasterCard or Visa regulations to the contrary and you understand and agree that this (your) waiver and agreement to this “credit card dispute waiver” provision will be provided to your payment method (credit card company) as proof of your acknowledgment and unconditional waiver to dispute payment to Federal Resume Experts. Federal Resume Experts reserves the right to enforce all non-payments through a third party collection agency and to report you to the three major credit bureaus as an unpaid debt. (f) SAME DAY FEDERAL RESUME REVISION RULE: You must contact your assigned lead editor the SAME DAY your federal resume is provided to you for your assigned lead editor to make one (1) federal resume revision regardless of satisfaction, or you assume and expressly understand and agree that YOU will be solely responsible for making any and all revisions to your federal resume yourself after the same day your federal resume is provided to you and your one (1) federal resume revision is provided due to the volume of customers similarly situated. All requests for revisions must be made the same day your federal resume is sent to you and must be accompanied with very specific substantive information (not subjective opinions) for your editor to incorporate into your federal resume. Subjective claims made by customers and/or third parties as to the quality of services will be ignored since services are provided in accordance with these particular terms only. If you fail to provide your editor with specific information and with instructions on how and where to include the information in your federal resume, then Federal Resume Experts and/or your assigned editor may at his/her discretion ignore your request, or make one (1) federal resume revision with or without your input in accordance with the same day federal resume revision rule ONLY to ensure that your federal resume meets minimum U.S. Office of Personnel Management (OPM) resume guidelines per the OPM OF-510 (now obsolete, the content of which has been adopted by USAJOBS®, irrespective of any additional specific information requested in the vacancy announcement or by you.) All federal resumes come with certain editor added job series specific “buzzwords” as determined solely by us and/or your assigned editor. You expressly understand and agree that if your 1 (one) federal resume revision request does not affect the following federal resume (OPM OF-510) items: 1. The Announcement number, title and grade of the job for which applying (indicate the lowest grade level that you will accept if applying for a position advertised at multiple grade levels); or 2. Full name, mailing address, day and evening phone numbers, social security number, country of citizenship, branch and date of military service, and highest federal civilian grade held, if applicable; or 3. High school name and location, date of diploma or highest grade completed, college name and location, majors, type and year of any degrees received; or 4. Work experience that includes job titles, duties and accomplishments, employer’s name and address, supervisor’s name and phone number, starting and ending dates, hours per week and salary; and to include all periods of unemployment; or 5. List of other qualifications such as job related training courses, job related skills, job related certificates and job related honors, awards and special accomplishments; then Federal Resume Experts may in our sole discretion deny your one (1) same day federal resume revision request, and YOU will be solely responsible for making any and all revisions to your federal resume prior to the USAJOBS® vacancy announcement closing date. You assume and expressly understand and agree that your job duties (position description) and/or work history will only be edited in accordance with this rule for spelling errors only; otherwise, your job duties (work history) and/or accomplishments will remain unchanged. Federal Resume Experts does not modify or change a customer’s job duties (position description) and/or work history and accomplishments during the federal resume development process. (g) You assume and expressly understand and agree that complimentary “FREE”, lifetime KSA or Questionnaire Creation services, and any KSA/Questionnaire/SES ECQs/PTQs/MTQs, or equivalent services that are provided with your federal resume and/or requested separately are strictly provided “AS IS” and revisions are not offered and will not be honored or provided on these services regardless of satisfaction or for any reason due to the huge volume of lifetime service requests. By ordering Federal Resume Experts’ lifetime KSA and/or Questionnaire Creation, you understand and agree to be bound by the following: ALL LIFETIME KSA AND/OR QUESTIONNAIRE CUSTOMER SERVICE REQUESTS ARE LIMITED TO ONE (1) REQUEST PER MONTH AND MUST BE SUBMITTED AT LEAST 30 DAYS PRIOR TO THE CLOSING DATE OF THE USAJOBS® VACANCY ANNOUNCMENT TO BE HONORED DUE TO THE HIGH VOLUME OF LIFETIME KSA AND QUESTIONNAIRE SERVICE REQUESTS. THESE SPECIFIC AND DETAILED LIFETIME KSA AND QUESTIONNAIRE SERVICE TERMS AND CONDITIONS ARE TO ENSURE THAT WE MAY CONTINUE TO OFFER ALL CUSTOMERS THIS VALUABLE LIFETIME KSA AND QUESTIONNAIRE SERVICE IN AN EFFICIENT AND TIMELY MANNER. Due to the high volume of lifetime service requests made daily by our customers, Federal Resume Experts will make every attempt to fulfill lifetime Creation service requests in a timely manner in accordance with our policies (which may be amended without notice), however, you understand and agree that not every KSA or Questionnaire lifetime service request made by you will be honored and/or completed each and every time if, (there is a conflict with other customers’ expedited order request(s) which will take priority every time over all lifetime KSA or Questionnaire Creation service requests) and; therefore, there will be times when a submitted KSA or Questionnaire lifetime service request will not be completed prior to the USAJOBS® posted closing date. You agree to accept these specific terms and conditions in consideration for receiving lifetime KSA and/or Questionnaire services. Terms and conditions for add-on lifetime Creation services may be amended from time to time by us without notice to you, and as long as Federal Resume Experts chooses to continue to offer lifetime creation services and/or remains in business and/or the federal government requires KSAs or equivalent requirements. *KSAs or Questionnaires were not specified as a required document specifically under the ‘How to Apply’ tab in your USAJOBS® vacancy announcement; IMPORTANT (customers are responsible for self-responding to the following themselves: Application Manager questions/Questionnaire radio buttons, any Online Questionnaire questions which are not directly viewable from the USAJOBS® Site by clicking a preview link, i.e., unless the link from USAOJBS to the questionnaire says, “To preview questionnaire questions please click here”, the questionnaire is not covered under the terms; questionnaires containing more than two (2) essay questions, core questions, writing samples, mandatory/optional written statements, Assessment Factors, etc., and similar non-KSA questions themselves). (i) KSA/Questionnaire/SES ECQs/ PTQs/MTQs, or equivalent responses ARE WRITTEN IN A STYLE AND FORMAT CHOSEN BY YOUR ASSIGNED EDITOR NOT BY YOU AND ARE WRITTEN “AS IS” COMPREHENSIVELY IN BULLET and/or NARRATIVE STYLE FORMAT which you expressly understand and agree to, AND KSA/Questionnaire/SES ECQs/ PTQs/MTQs, or equivalent REWRITES ARE NOT OFFERED ON ANY KSA/Questionnaire/SES ECQs/ PTQs/MTQs, or equivalent OR OTHER COMPLIMENTARY “FREE”, LIFETIME SERVICE CREATION OR ADVERTISED LIMITED TIME SERVICE OFFER(S) REGARDLESS OF CUSTOMER SATISFACTION OR REASON; Our Satisfaction Guarantee is subject to our same day federal resume revision rule and does not apply to other services, i.e., Lifetime Creation Services/KSA/Questionnaire/SES ECQs/MTQs, or equivalent services; YOU EXPRESSLY UNDERSTAND AND AGREE THAT YOU ARE PERSONALLY RESPONSIBLE TO ANSWER ALL VACANCY ANNOUNCEMENT (KSA/SES ECQs/ PTQs/MTQs, or equivalent or other) QUESTIONS NOT DIRECTLY DISPLAYED IN YOUR TARGET USAJOBS® VACANCY ANNOUNCEMENT YOURSELF AND YOU UNDERSTAND AND AGREE THAT YOU ARE PERSONALLY RESPONSIBLE AND NOT YOUR ASSIGNED EDITOR OR FEDERAL RESUME EXPERTS TO ENSURE THE TRUTHFULNESS AND/OR ACCURACY OF INFORMATION CONTAINED IN ANY PART OF YOUR FEDERAL RESUME PACKAGE PRIOR TO SUBMISSION. IN GENERAL, ALL COMPLETED SERVICES ARE PROVIDED ELECTRONICALLY TO A CUSTOMER SPECIFIED AND/OR PROVIDED EMAIL(S) ADDRESS(ES) PROVIDED TO FEDERAL RESUME EXPERTS AND/OR PROVIDED OR USED BY YOU TO COMMUNICATE WITH FEDERAL RESUME EXPERTS AT ANYTIME; YOU HEREBY EXPRESSLY CONSENT, UNDERSTAND AND AGREE THAT WE IDENTIFY YOU BY YOUR EMAIL(S) ADDRESS(ES) AND ANY AND ALL DOCUMENTS (EMAIL(S) OR OTHERWISE) SENT TO FEDERAL RESUME EXPERTS BY YOU USING ANY OF THESE EMAIL(S) ADDRESS(ES) WILL BE ASSUMED BY US TO IN FACT BE YOU (THE PAYMENT METHOD CARDHOLDER AND NOONE ELSE) AND THAT YOU EXPRESSLY CONSENT, UNDERSTAND AND AGREE TO BE SOLELY RESPONSIBLE FOR ANY FEES AND/OR CHARGES INCURRED TO YOUR PAYMENT METHOD (YOUR CREDIT CARD) AS A RESULT OF ANY DOCUMENTS, EMAIL(S), OR COMMUNICATIONS BY YOU TO US VIA THESE PROVIDED AND/OR USED EMAIL(S) ADDRESS(ES) FOR SERVICES WHETHER ACTUALLY SENT BY YOU OR SOMEONE ELSE USING YOUR PROVIDED EMAIL(S) ADDRESS(ES), INCLUDING, BUT NOT LIMITED TO, FEDERAL RESUME CUSTOM-TAILORING SERVICES. (j) CUSTOMERS UNDERSTAND AND AGREE THAT AS PART OF THE FEDERAL RESUME CREATION PROCESS, Federal Resume Experts and/or your assigned editor SHALL LEAVE your ORIGINALLY SUBMITTED RESUME EMPLOYMENT HISTORY INFORMATION (i.e., JOB DUTIES/JOB DESCRIPTIONS/ACCOMPLISHMENTS) “AS IS” EXCEPT FOR spelling or typographical errors; otherwise, your employment history/ job duties/job descriptions and/or accomplishments will remain unchanged. YOU EXPRESSLY UNDERSTAND AND AGREE THAT IT WILL BE YOUR PERSONAL RESPONSIBILITY TO MODIFY/CONFIGURE/MANIPULATE/INPUT THE PROVIDED FEDERAL RESUME INFORMATION FROM Federal Resume Experts and/or your assigned editor INTO THE HIRING AGENCY’S REQUIRED FORMAT, I.E., RESUMIX OR OTHER SPECIALIZED RESUME FORMAT, STYLE, ETC., IF APPLICABLE, OR INPUT AND/OR CUT AND PASTE THE INFORMATION PROVIDED INTO THE HIRING AGENCY’S DATABASE YOURSELF. (k) FEDERAL RESUME EXPERTS AND/OR EDITORS ARE NOT RESPONSIBLE IN ANYWAY FOR ASSISTING/AIDING/OR PROVIDING INSTRUCTIONS TO CUSTOMERS WITH SUBMITTING THEIR APPLICATION MATERIALS. (l) GENERALLY, CURRENT FEDERAL EMPLOYEE FEDERAL RESUME EXPERTS’ CUSTOMERS EXPRESSLY UNDERSTAND AND AGREE THAT YOU MUST PROVIDE A COPY OF YOUR LATEST OFFICIAL SF-50 TO US AS A CONDITION PRECENDENT TO RECEIVE ANY FREE RESUME SERVICES AND/OR LIFETIME KSA SERVICES, SUBJECT TO CHANGE; IT IS WITHIN Federal Resume Experts’ and/or your assigned editor’s SOLE DISCRETION TO DENY YOUR REQUEST FOR THESE SERVICES AT ANY TIME IF WE DO NOT HAVE A COPY OF YOUR LATEST OFFICIAL SF-50 ON FILE SHOWING PROOF OF YOUR CURRENT FEDERAL EMPLOYMENT STATUS. WE MUST HAVE A COPY OF YOUR LATEST OFFICIAL SF-50 BEFORE WE PROVIDE YOU WITH ANY FREE SERVICES (RESUME UPDATING AND REVISING AND/OR LIFETIME KSA SERVICES). FREE FEDERAL RESUME UPDATING AND REVISING SERVICES AS ADVERTISED MEANS AND ONLY INCLUDES ADDING NEW INFORMATION PROVIDED BY YOU, INCLUDING, BUT NOT LIMITED TO: ADDING NEW EMPLOYMENT INFORMATION, AWARDS, TRAININGS, VOLUNTEER WORK, ETC. IT DOES NOT INCLUDE FEDERAL RESUME CUSTOM-TAILORING SERVICES WHICH SHALL INCLUDE A $100 MINIMUM FEDERAL RESUME CUSTOM-TAILORING FEE ($150 FEE SHALL APPLY FOR SES REQUESTS). (m) FEDERAL RESUME CUSTOM-TAILORING SERVICES MEANS ADDING JOB SERIES SPECIFIC “BUZZWORDS” (the content and choice of buzzwords are SOLELY WITHIN FEDERAL RESUME EXPERTS’ DISCRETION) AND/OR MODIFYING A CUSTOMER’S ORIGINALLY PROVIDED FEDERAL RESUME AS SPECIFIED HEREIN TO APPLY TO A DIFFERENT/NEW VACANCY ANNOUNCEMENT NUMBER. ADDITIONAL CHARGES SHALL APPLY FOR FEDERAL RESUME CUSTOM-TAILORING SERVICES WHETHER A CUSTOMER IS MADE AWARE OF THEM OR NOT. YOU EXPRESSLY ASSUME, UNDERSTAND AND AGREE THAT AS A CONDITION TO RECEIVE FEDERAL RESUME CUSTOM-TAILORING SERVICES YOU AUTHORIZE FEDERAL RESUME EXPERTS OR ITS AGENTS TO CHARGE YOUR PAYMENT METHOD (YOUR CREDIT CARD) AUTOMATICALLY WITHOUT YOUR EXPRESS OR SIGNED WRITTEN CONSENT. (n) If multiple vacancy announcements are sent for completion, editors may use their own discretion in deciding which announcement to work on and complete first regardless of order (unless you specify and it is unequivocally clear to the editor which announcement you want worked on first). (o) ADDITIONAL CHARGES SHALL APPLY FOR FEDERAL RESUME CUSTOM-TAILORING SERVICES WHETHER YOU ARE MADE AWARE OF THEM OR NOT. Federal Resume Custom-Tailoring Services have a minimum fee of $100.00. Additional fees are applicable for expedited services. Federal Resume Custom-Tailoring Service fees are subject to change without notice. YOU EXPRESSLY UNDERSTAND, CONSENT TO AND AGREE THAT AS A CONDITION TO RECEIVE FEDERAL RESUME CUSTOM-TAILORING SERVICES YOU AUTHORIZE FEDERAL RESUME EXPERTS OR ITS AGENTS TO CHARGE YOUR PAYMENT METHOD (YOUR CREDIT CARD) AUTOMATICALLY WITHOUT YOUR EXPRESS OR SIGNED WRITTEN CONSENT. ALL COMPLETED SERVICES ARE PROVIDED ELECTRONICALLY TO YOUR SPECIFIED AND/OR PROVIDED EMAIL(S) ADDRESS(ES) PROVIDED TO FEDERAL RESUME EXPERTS VIA YOUR INITIAL ORDER AND/OR PROVIDED OR USED BY YOU TO COMMUNICATE WITH FEDERAL RESUME EXPERTS AT ANYTIME; “SELF-AUTHENTICATING PROVISION”: YOU HEREBY CONSENT AND EXPRESSLY AGREE THAT ANY ELECTRONIC COMMUNICATION(S) (i.e., EMAIL) SENT TO FEDERAL RESUME EXPERTS BY YOU USING ANY OF THESE EMAIL(S) ADDRESS(ES) IS YOU (THE PAYMENT METHOD “CREDIT CARD” CARDHOLDER AND NOONE ELSE) AND THAT YOU WILL BE SOLELY RESPONSIBLE FOR ANY FEES AND/OR CHARGES INCURRED TO YOUR PAYMENT METHOD (YOUR CREDIT CARD) AS A RESULT OF THE COMMUNICATION(S) TO US VIA YOUR PROVIDED AND/OR THESE USED EMAIL(S) ADDRESS(ES) FOR SERVICES PROVIDED TO YOU WHETHER ACTUALLY SENT BY YOU OR SOMEONE ELSE USING YOUR PROVIDED EMAIL(S) ADDRESS(ES), INCLUDING, BUT NOT LIMITED TO, FEDERAL RESUME CUSTOM-TAILORING SERVICES. FEDERAL RESUME EXPERTS SHALL HAVE THE RIGHT TO MODIFY THESE TERMS AND CONDITIONS AT ANY TIME WITHOUT NOTICE. (p) You expressly consent, understand and agree to Federal Resume Experts to use and display your testimonials or remarks on the Site in any manner and for any reason. Although you may "bookmark" a particular portion of the Site and thereby bypass this Agreement, your use of this Site still binds you to these Terms and Conditions. Federal Resume Experts reserves the right to amend and/or update or modify these Terms and Conditions at any time without prior notice to you. Your use of the Site following any such change constitutes your unconditional agreement to follow and be bound by the new Terms and Conditions however provided. For this reason, we encourage you to review the Terms and Conditions whenever you use the Site. (q) By using this Site, Users’ certify that you are 18 years of age or older. If you are under the age of 18 you may use this Site only under the supervision of a parent or legal guardian who agrees to be bound by these Terms and Conditions. Federal Resume Experts does not intentionally collect personal information of individuals under the age of 18. Individuals under the age of 18 may not use this Site and parents or legal guardians may not agree to these Terms and Conditions on their behalf. If you are a parent or legal guardian agreeing to these Terms and Conditions for the benefit of an individual under the age of 18, be advised that you are fully responsible for his or her use of this Site, including all financial charges and legal liability that he or she may incur. If you do not agree to (or cannot comply with) any of these terms and conditions, do not use this Site. All billing information provided must be truthful and accurate. Providing any untruthful or inaccurate information may constitute a breach of these Terms and Conditions and may result in your civil and/or criminal liability. (r) Federal Resume Experts reserves the right at any time and from time to time to modify or discontinue, temporarily or permanently any services (or any part thereof) with or without notice. You agree that Federal Resume Experts shall not be liable to you or to any third party for any modification, suspension or discontinuance of any services to you for any reason. (s) Expedited Service orders are guaranteed only on orders received by 6:00am (EST) of the date of order; expedited orders received after 6:00am (EST) on the date of order will be completed by midnight the following “business” day. (t) Federal resumes are prepared as expeditiously as possible when all required information is provided by you upon placing your initial order; services may be delayed beyond the stated or promised completion time or vacancy closing date if all requested information or needed information is not initially provided to us and/or your assigned editor. (u) Customers understand and agree to communicate with their assigned editor via email only, and communication with an editor by telephone and/or in person may or may not be possible since editors are located throughout the United States in their respective federal positions. Although Editors make every attempt to contact you prior to beginning work on your federal resume package, we cannot guarantee that your assigned editor will in fact contact you by phone prior to completing your federal resume package. Editors handle multiple accounts simultaneously and customers understand and agree that they will experience delays in receiving responses from editors from time to time. Editors are only responsible for working on one vacancy announcement per order; an applicable $100 federal resume custom-tailoring fee shall apply for each subsequent job announcement request. (v) Failure to provide the hiring agency and/or officials with all the required information as stated in the vacancy announcement in the manner required which may result in an ineligible rating or which may affect your overall rating is solely your responsibility and not Federal Resume Experts and/or its editors. Federal Resume Experts and its editors are not responsible for the accuracy of personal information; customers must review their information and correct any inaccuracies prior to use. (w) You expressly understand, consent to and agree that if an editor with direct knowledge and experience in your job field and/or job series cannot be contracted, identified, secured, retained, located or otherwise assigned to your account as advertised or for whatever reason then any Federal Resume Experts’ editor will be immediately assigned to your account to ensure that your ordered services are provided to you in a timely manner and/or to meet your target vacancy announcement closing date regardless of user satisfaction. (x) If your vacancy announcement closes or is canceled prior to the stated announcement closing date, you agree to pay Federal Resume Experts the full amount of your order for any services provided. Take advantage of our Refer-A-Friend Referral Program and receive a check for $100 for referring 10 friends to us. 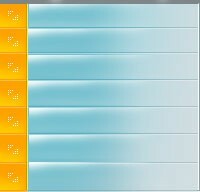 For every 10 qualified referrals*, you’ll earn $100. Then refer another 10 new friends and get another check for $100. There’s no limit on the number of referrals you can make or the number of $100 checks you can earn! S o refer anyone you think would be interested in getting a federal resume. Simply email us your name and customer ID to referafriend@federalresumeexperts.com along with the names and e-mail addresses of those friends you want to refer OR who has purchased either a $205.00 or $299.95 federal resume package on or after September 1, 2016 through your referral. After 10 qualified referrals*, you’ll earn $100, as long as your account is in good standing. Earn with our simple refer 10 get $100 program and help us connect more job seekers with federal employment opportunities across the United States and around the world! *Qualified referrals are verified new customers who purchase either a $205.00 or $299.95 federal resume package on or after September 1, 2016. Terms and conditions subject to change without notice. (z) Veteran of military spouse must submit and provide us acceptable documentation of your preference or appointment eligibility to receive free military spouse resume. Family Member Appointing Authorities are not an entitlement. Knowing about these authorities and identifying your eligibility will enhance your job search. Check vacancy announcements, which should clearly state "Who May Apply." Military Spouse Appointing Authority (Executive Order 13473) allows agencies to appoint a military spouse without competition. Agencies can choose to use this authority when filling competitive service positions on a temporary (not to exceed 1 year), term (more than 1 year but not more than 4 years), or permanent basis. The authority does not entitle spouses to an appointment over any other applicant. As a military spouse you are eligible under this authority if your active duty military spouse: 1) receives a Permanent Change of Station (PCS) move; 2) has a 100% disability rating; or 3) died while on active duty. Links to Other Sites. Federal Resume Experts contains links to third party web sites. These links are provided solely as a convenience to you and not as an endorsement by Federal Resume Experts of the contents on such third-party web sites. Federal Resume Experts is not responsible for the content of linked third-party sites and does not make any representations regarding the content or accuracy of materials on such third-party web sites. If you decide to access linked third-party web sites, you do so at your own risk. Amendments to this Agreement and Changes to Site. Federal Resume Experts may revise or amend this Agreement at any time by updating this page. Changes will be binding on you on the date they are posted on the Site (or as otherwise provided to you). Any use of the Site will be considered acceptance by you of the then-current Terms and Conditions. If at any time you find the Terms and Conditions unacceptable, you may not use the Site any longer. Any new or different terms supplied by you are specifically rejected by Federal Resume Experts unless Federal Resume Experts agrees to them in a signed writing specifically including those new or different terms. Federal Resume Experts may change the Site at any time without notice to you. In addition, when using this Site or services, you shall be subject to any new Terms and Conditions to the Site or such services, which may be posted from time to time. Indemnity. You agree to defend, indemnify, and hold harmless Federal Resume Experts (and its officers, directors, employees, editors and agents) from and against any third party claims, actions or demands (including, without limitation, costs, damages and reasonable legal and accounting fees) alleging or resulting from or in connection with your use of the Site, any Document provided to you, or your breach of this Agreement. Federal Resume Experts shall use reasonable efforts to provide you prompt notice of any such claim, suit, or proceeding and may assist you, at your expense, in defending any such claim, suit or proceeding. The Federal Resume Experts Site and the Content may contain inaccuracies or typographical errors. Federal Resume Experts makes no representations about the accuracy, reliability, completeness, or timeliness of any Content. The use of the Federal Resume Experts Site is at your own risk. Changes are periodically made to the Federal Resume Experts Site and may be made at any time without prior notice. You acknowledge and agree to any changes to the material terms of the Federal Resume Experts Site made by Federal Resume Experts at any time . Federal Resume Experts customers are solely responsible for reviewing and correcting any information contained in their federal resume orders prior to use. Federal Resume Experts and its editors are not responsible for the accuracy of personal information; customers must review their information and correct any inaccuracies prior to use. Federal Resume Experts shall not be responsible for any employment decisions made by third parties, for whatever reason. Federal Resume Experts cannot guarantee and does not promise any specific results from use of the Federal Resume Experts Site or Services. No advice or information, whether oral or written, obtained by a User from Federal Resume Experts through or from any Federal Resume Experts Site shall create any warranty not expressly stated herein. General and GOVERNING LAW AND JURISDICTION. 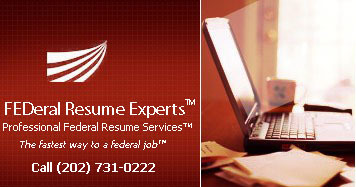 Federal Resume Experts contact information is listed on the Site. Federal Resume Experts makes no claims that the Content is appropriate or may be downloaded outside of the United States . Access to the Content may not be legal by certain persons or in certain countries, and such persons have no right to access or use the Site. If you access Federal Resume Experts from outside of the United States , you do so at your own risk and are responsible for compliance with the laws of your jurisdiction. This Agreement, is governed by the internal substantive laws of the State of Maryland , without respect to its conflict of laws principles. Jurisdiction for any claims arising under this Agreement shall lie exclusively with the state or federal courts in the State of Maryland . You agree to submit to the personal and exclusive jurisdiction of the courts located within the county of Montgomery County , Maryland . You agree that regardless of any statute or law to the contrary, any claim or cause of action arising out of or related to use of the Site or services must be filed within 1 year after such claim or cause of action arose or be forever barred. The sole relationship between You and Federal Resume Experts is that of independent contractors. If any provision of this Agreement is found to be invalid by any court having competent jurisdiction, the invalidity of all or part of a provision shall not affect the validity of the remaining parts and provisions of this Agreement, which shall remain in full force and effect. All provisions of this Agreement shall survive termination except those granting access or use to the Site, and you shall cease all your use and access thereof immediately. You may not assign or transfer your obligations under this Agreement. No waiver of any term of this Agreement shall be deemed a further or continuing waiver of such term or any other term. Except as expressly provided by Federal Resume Experts in a particular "Legal Notice," or software license or material on particular Web pages of the Site, this Agreement, constitutes the entire agreement between you and Federal Resume Experts. User Rules. Documents provided to Federal Resume Experts may not contain keywords or white text keywords (including any words embedded in the Document and hidden from us or the Editor; anything that is discriminatory, sexually explicit, obscene, libelous, defamatory, threatening, harassing, abusive, or hateful; or anything that is embarrassing or offensive to another person or entity. You may not use Document(s) provided by editors to: (i) impersonate another person, living or dead; (ii) provide false, inaccurate or misleading information. Federal Resume Experts is under no obligation to monitor the Documents or information provided on the Site, but it may monitor Documents at random. Documents securely stored by us may be removed or deleted at Federal Resume Experts’ sole discretion for any reason at anytime. Federal Resume Experts is under no obligation to monitor the conduct of its Editors. Users are prohibited from violating or attempting to violate the security of the Site, including, without limitation: (i) accessing data not intended for such User or logging into a server or account which the User is not authorized to access; (ii) attempting to probe, scan or test the vulnerability of a system or network or to breach security or authentication measures without proper authorization; (iii) attempting to interfere with service to any User, host or network, including, without limitation, via means of submitting a virus to the Site, overloading, "flooding", "mailbombing" or "crashing"; (iv) sending unsolicited e-mail, including promotions and/or advertising of products or services; (v) forging any TCP/IP packet header or any part of the header information in any e-mail or newsgroup posting. Violations of system or network security may result in civil or criminal liability. (b) Violation of these User Rules may result in civil or criminal liability. Federal Resume Experts will investigate occurrences which may involve such violations and may involve, and cooperate with, law enforcement authorities in prosecuting Users who are involved in such violations. Recognizing the global nature of the Internet, you agree to comply with all applicable laws regarding the transmission of data over the internet both in the United States or the country in which you reside. Security. When you place an order online, User personal details and credit card information may be scrambled using SSL encryption technology. Although we cannot guarantee encryption or the privacy of your personal details and credit card information, SSL makes it very difficult for User information to be stolen or intercepted while being transferred. We do not sell our users' personal information to anyone for any reason if the user has indicated a desire for us to keep the information private. Federal Resume Experts may also disclose specific user information when we determine that such disclosure is necessary to comply with the law, to cooperate with or seek assistance from law enforcement or to protect the interests or safety of Federal Resume Experts or its editors. In addition, personal information we have collected may be passed on to a third party in the event of a transfer of ownership or assets or a bankruptcy of Federal Resume Experts. These Terms constitute a binding agreement between You and Federal Resume Experts, and is accepted by You upon your use of the Site. Copyright 2017, Federal Resume Experts Inc. All rights reserved.